Feeling out of control. In an Iranian study a second emotion was reported that does not appear in European literature: a feeling of shame. The importance of being given good information so they know what to do. The importance of being treated respectfully as a parent of the baby, not just as a support to the mother. Going back to work and the breadwinner role, and regaining feelings of confidence and competence in this different environment. Fathers can display ambivalence about their capacity to care. Some are scared to handle to the baby and argue that this is mainly the mother’s role. But when fathers are actively engaged to overcome these fears – or if the mother is too ill to do any care for a while – fathers typically express more positive emotions, particularly those who practice skin-to-skin care. The researchers, Livio Provenzi and Elena Santoro, at the Scientific Institute IRCCS Eugenio Medea in Bosisio Parini, Italy, make five recommendations for improving practice in neonatal units. Treat fathers respectfully as parents, not just as partners of mothers. Provide tailored information to fathers – ask them what information they want at the different stages. Encourage father presence, taking into account their mixed feelings about the NICU environment and their work. Engage fathers in daily care, particularly encouraging skin-to-skin care of the baby, and not just when the mother is too ill to do it herself. Be culturally sensitive, since culture frames the different reactions of fathers and mothers and cultures vary. 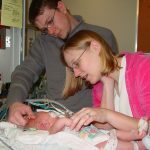 The researchers criticise the gender blindness of much discussion of parents in NICUs, given the differences in reactions between mothers and fathers. It can lead to a critical bias in the literature and from there to misleading conclusions about the best ways to support parents. Optimal clinical support to parents in the NICU should start from a careful consideration of gender-related differences in parenting, particularly parenting under pressure. Photo: Jim Lynch. Creative Commons.